Zeinab Ibrahim is a sociolinguist of Arabic and a Teaching of Arabic as a Foreign Language (TAFL) professor. She earned her Ph.D. from Georgetown University, Washington, D.C. She holds an M.A. in Teaching Arabic as a Foreign Language (TAFL) and another in communication, both from the American University in Cairo. Her most recent book is "Beyond Lexical Variation in Modern Standard Arabic: Egypt, Lebanon and Morocco." In addition to four edited books, she published many articles investigating the Arabic language, linguistics and sociolinguistics. 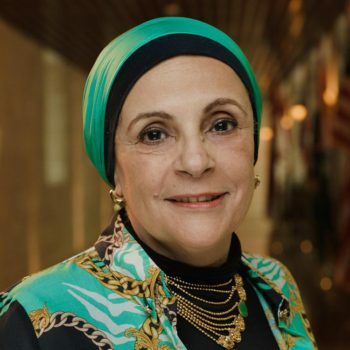 She was the president of the American Association of Teachers of Arabic (AATA), executive director of CASA (Center for Arabic Study Abroad) and other administrative positions. She has organized several international conferences and received several grants. Ph.D., Arabic Linguistics, Georgetown University, Washington, D.C. Most of my papers are original research on linguistic and sociolinguistic of Arabic learning and teaching. Ibrahim, Zeinab, Beyond Lexical Variation in Modern Standard Arabic. London: Cambridge Scholars Publishing, UK, April 2009. Ibrahim, Zeinab and Sanaa Makhlouf (Editors). Arabic Teaching and Linguistics in an Age of Globalization. Cairo: AUC Press, 2008. Ibrahim, Zeinab, Sabiha Aydelott and Nagwa Kassabgy (Editors). Perspectives in Contrastive Studies. Cairo: AUC Press, spring 2004. Ibrahim, Zeinab, Sabiha Aydelott and Nagwa Kassabgy (Editors). Diversity in Language, Linguistics, and Teaching: Arabic and English. Cairo: AUC press, November 2000. Ibrahim, Zeinab. “Language Variation, Identity and Planning.” In Arabe standard et variations régionales. Quelle(s) politique(s) linguistique(s) ? Quelle(s) didactique(s), éditions Les archives contemporaines, collection PLID (Pluralité des langues et des identités en didactique),Paris, Forthcoming, 2016. Papadopoulos, P. M., Ibrahim, Z., & Karatsolis, A. (2016). Learning Arabic Through Play Games on Tabletop Surface Computers in Early Childhood. In Zvacek, S., Restivo, M. T., Uhomoibhi, J., & Helferts, M. (Eds. ), Computer Supported Education 2015, Communications in Computer and Information Science, 583, pp. 208-224. Springer International Publishing. doi: 10.1007/978-3-319-29585-5_12. Papadopoulos, P. M., Ibrahim, Z., & Karatsolis, A. (2015). Educational Games for Early Childhood: Using Tabletop Surface Computers for Teaching the Arabic Alphabet. In Helfert, M., Restivo, M. T., Zvacek, S., & Uhomoibhi, J. (Eds.). Proceedings of 7th International Conference on Computer Supported Education – CSEDU 2015, pp. 130 – 138. Papadopoulos, P. M., Ibrahim, Z., & Karatsolis, A. (2014). Teaching the Arabic Alphabet to Kindergarteners: Writing Activities on Paper and Surface Computers. In S. Zvacek, M. T. Restivo, & J.Uhomoibhi (Eds. ), Proceedings of the 6th International Conference on Computer Supported Education, CSEDU 2014, Barcelona, Spain, 1-3 April, 2014 (pp. 433-439). SCITEPRESS. ISBN: 978-989-758-022-2. Ibrahim, Zeinab & Karatsolis , Andreas ”Excluding Speakers of the Dominant Variety ; Two Cases from Greek and Arabic.” In Rudolf Muhr, Carla Amorós Negre, Carmen Fernández Juncal, Klaus Zimmermann Emilio Prieto und Natividad Hernández (eds.) (2013): Exploring linguistic standards in non-dominant varieties of pluricentric languages. Frankfurt A.M. / Wien et. al. Peter Lang Verlag. June 2013 (131-144). Ibrahim, Zeinab. “A Module of Developing Syllabi and Lesson Plans in Arabic”. The Arabic Teacher Training Web Site (tadriis.org) Forthcoming, May 2013. Ibrahim, Zeinab, “Love –Fear Relationship: Arab Attitudes toward the Arabic Language.” In The Eminent Scholars Series: Interculturalism. Essays in honor of Professor Mohamed Enani., May, 2013 (339-360). Ibrahim, Zeinab. “Instructor –Student Communication: Cultural Misconceptions” in Global Media Journal (December 2012) Volume 3, Number 2. Ibrahim, Zeinab. “Egyptian Revolution 2011 Slogans: Intuitive Language Choices between Dominating and Non-Dominating Varieties of Arabic” in Rudolf Muhr (ed.) Non-dominating Varieties of Pluricentric Languages: Getting the Picture, In Memory of Professor Michael Clyne. Frankfurt: Peter Lang 2012 (401-414). Ibrahim, Zeinab & Mohab Attia. “Egyptian Native Speakers’ Awareness on the Relatedness of Varieties: The Case of Arabic.” in Language and Knowledge in Middle Eastern Societies. London: Cambridge Scholars Publishing, UK, 2010 (111-131). Ibrahim, Zeinab. “Cases of Written Code-switching in Opposition Egyptian newspapers” in Bassiouney, Reem (Editor). Arabic and the Media. Leiden: Brill, April, 2010(23-45). Ibrahim, Zeinab and Sanaa Makhlouf (Editors). Arabic Teaching and Linguistics in an Age of Globalization. Cairo: AUC Press, 2008 (16-44). Ibrahim, Zeinab. "Lexical Variation in Modern Standard Arabic" in The Encyclopedia of Arabic Language and Linguistics (EALL). Leiden: Brill Publishers, 2008, III, (13-21). Ibrahim, Zeinab and Jehan Allam. "Arabic Learners and Heritage Students Redefined: Past, Present and Future" in Handbook for Arabic Language Teaching in the 21st Century. Edited by Kassem Wahba, Zeinab Taha and Liz England. Mahwah, New Jersey: Lawrence Erlbaum Associates Publishers, 2006 (437-446). Ibrahim, Zeinab. "Polysemy in the Arabic Dialects" in Investigating Arabic. Edited by Alaa Elgibali. Leiden: Brill Publishers, January 2005 (51-64). – إبراهيم , زينب . " الدلالات و التداعيات الثقافية و علاقاتها بالقراءة للفهم " في العربية : أبحاث لغوية و اجتماعية و تربوية . تحرير : علاء الجبالي و السعيد بد وي . القاهرة : دار غريب . 2002 من 179-188. Ibrahim, Zeinab. “Myths About Arabic Revisited.” Al-Arabiyya 33 (2000): 13-27. Parkinson, Dilworth and Zeinab Ibrahim. "Testing Lexical Differences in Regional Standard Arabics" in Perspectives on Arabic Linguistics XII. Edited by Elabbas Benmamoon. Philadelphia: John Benjamins, 1999 (183-202). Ibrahim, Zeinab and Deborah Kennedy. 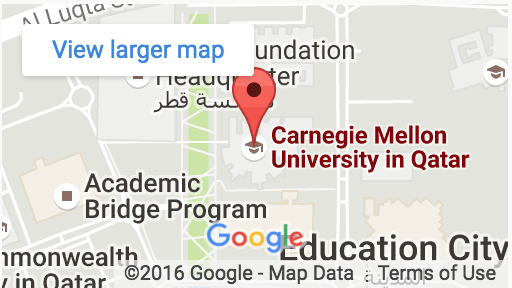 “Figurative Language in the Speech Patterns of Egyptians and Americans” in Understanding Arabic. Editor: Alaa Elgibali. Cairo: AUC Press, 1996 (181-209). Arabic and Islamic Studies, Minor Advisor, CMUQ September 2013-present. Representative of CMUQ in the Qatar Foundation (QF)Arabic language and Culture strategy Initiative 2014-present. Member of Academic Review Board (ARB) at CMUQ, 2012-present. Member of CMUQ Promotion and contract renewal committee, 2012- present. Member of Qatar Foundation Speakers Bureau, 2011- May 2014. Member of CMUQ Distinguished Member series, May 2010-June 2011. Member of LAS committee on Orientation of LAS New Faculty, May 2010-June 2011. Member of the Occasional Paper Series, CMU-Q, September 2010-July 2011. Involved in teachers’ training and decision making concerning curricula, instructors hiring and retention, research needsConsultant to “pedagogy for heritage learners.” NPRP grant 2009-May 2012. Consultant to the United Nations, Arabic Department, New York, 2002-2013. Consultant to the National Foreign Language Center (NFLC) at the University of Maryland, 2001- 2004. Member of the review committee of the conference of the World Organization for the Renaissance of the Arabic Language, November –December, 2015. Judge for the seminal Qatar STEM 2015 competition event, a National Intel ISEF competition for Qatar-based high school student teams, May –June 2015. Member of the Strategic Planning committee of the World Organization for the Renaissance of the Arabic Language, February 2014- December 2014. Supervisor, Qatar Science Leadership program, QF, September 2014 – present. Vice President, Egyptian Ladies Association in Qatar, October 2011-February 2015. Consultant to Qatar Supreme Education Council (SEC), Enhancing Arabic Language Skills, May – July 2014. Participated in Dubai’s Governor’s initiative on improving the Arabic language in the Emirates.,2012. Reviewer of Promotion case, Boston University, 2012. Consultant to creating the Arabic Center at to Center Al-Azhar University, Cairo, Egypt, May 2011-12. Hawaii International Conference on Arts and Humanities.